This is an informal wrap-up summary for some Nyroth lore that hasn’t been fully revised yet. That’s right: I’m releasing placeholder short form lore. LOOOOOORE. LOOOOOOORE. YIP YIP YIP YIP YIP BAAAAHAA. BAAAAHAAA. 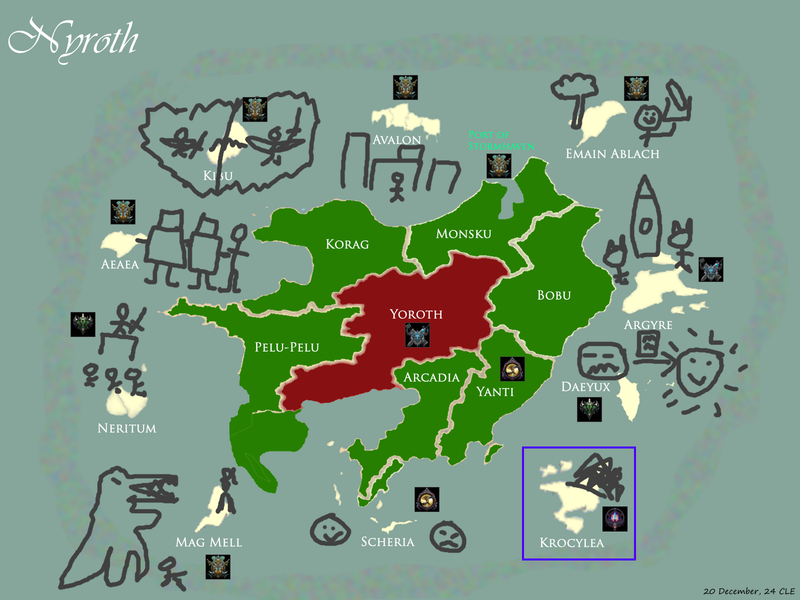 So, here are the major events that haven’t been properly lore’d yet. Annotated map, originally drawn by the ancient Nyrothian. Reflects the situation just prior to the end of the dispute. After the League issued its ruling, Ionia was given supreme authority over the mainland, while the islands went to their respective factions (Krocylea being placed under a League protectorate) and foreign affairs were turned over to Bilgewater, who also administer the floating city. Things got pretty intense post-Krocylea. Bilgewater, which had largely stayed out of the fighting there, used its authority as foreign emissary to have the island turned over to the League, leading to the creation of a League protectorate. The Freljord and the Shadow Isles were both sanctioned for their use of rune magic—and, in the case of the Shadow Isles, for trying to massacre everyone on the island, because Aatrox is one hell of a drug—with Bilgewater intervening to make the sanctions against the Freljord particularly harsh, as it was the Freljord’s runespell that triggered the Void rift.